With a world now full of crazy aero or Rocket Bunny–style builds, it’s sometimes refreshing to see a tidy street example. Jesse Williams, an apprentice mechanic from Tauranga, has owned this black beauty for four years now — but it didn’t always look this good. 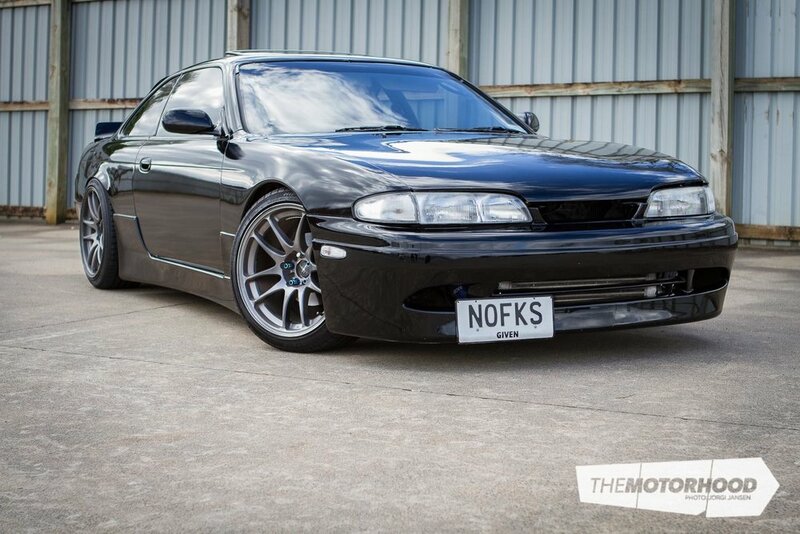 Jesse’s Nissan Silvia S14 has undergone a fair share of mechanical and cosmetic upgrades since he purchased it. 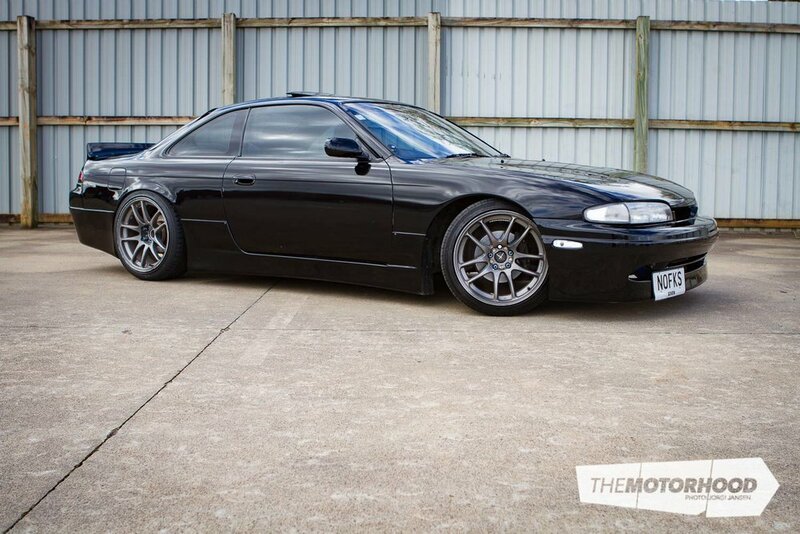 This S14 has still got the original SR20DET engine, and it’s had minimal modifications. The turbo, however, has been upgraded to a larger T3/T4 turbo with the addition of a 38mm Turbosmart external wastegate and a top-mount manifold to hold it all securely in place. These minor upgrades helped in producing a safe 208kW on 14psi of boost, even with the turbo being a cheap knock-off. The driveline now sports a six-puk Exedy brass-button clutch, which is bolted to a lightened flywheel. The factory differential has been done away with and replaced with a Nismo two-way mechanical differential. 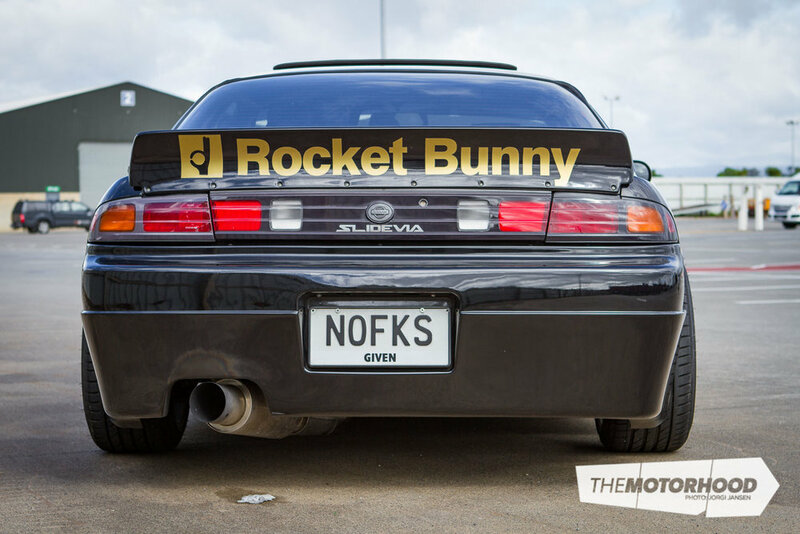 Cosmetically, Jesse’s S14 has been fitted with an Instant Gentleman Kit, with a genuine Rocket Bunny wing. After the kit was fitted, Jesse gave the car a lick of fresh black paint after having the right front guard blue for a long time. “People actually recognized my car for the blue guard that used to feature on the Silvia [as it] had been there for years,” He told us, laughing. The rear guards have been pumped out to give it more stance, as well as being able to accommodate the 18x9.5-inch Work CR-Kais that are fitted all round. Sitting very low on XYZ adjustable suspension and Hardrace adjustable suspension arms, I think Jesse has successfully achieved his goal of having a tough and tidy Nissan Silvia. With every modified road car, the certification process can be a nightmare. Jesse had a pretty rough time getting the car to a certifiable standard. Jesse has had to certify the car and has faced many battles with police about what was legal. After a gruelling certification process, Jesse’s Silvia is finally 100-per-cent road legal and he is loving it. Despite being certified for the road, Jesse hasn’t been able to hold himself back from entering a couple of track-based events. For Jesse, the build of this car has been a bit of an emotional roller coaster. “This car has taught me so much, and although there have been some really frustrating times over the last four years, I’m not sure I will ever have the heart to part ways with it.” Well done Jesse, I hope to see you on the track again in the near future. I will however suggest that maybe you trailer it to the next event! Until then, I’m sure we will all see Jesse driving his Nissan Silvia S14 around on the road accompanied by his proud, Dolmio grin.